LOOSE WEIGHT THE FUN WAY! 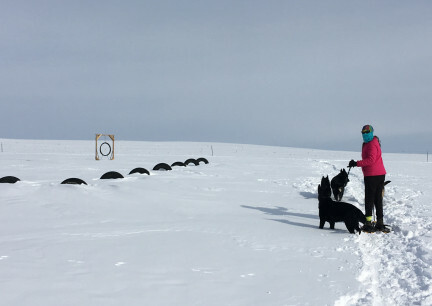 NOT ONLY WILL GETTING OUT AND ICE OR ROLLER SKATING, SKIING, SNOWSHOEING AND OR SLEDDING OR DOG SLEDDING, HELP YOU LOOSE WEIGHT, THE SUNSHINE IS GOOD FOR YOU AND YOU WILL BECOME STRONGER AND HEALTHIER! The Figure Skates I bought have THICK and a LOT of ankle support. I am old. 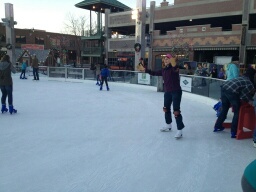 I have not skated for many years. <grins> I don't really want to break. Today, when I decide the type of Snow Shoes I want, Deron is going to order them from Amazon. Here we are January 1, 2015, a clean slate, I WANT to continue to be healthy and I REALLY WANT to get more weight off! So? I bought these Toys/Exercise Equipment. Worth the money if it keeps me Healthy. DO YOU KNOW WHAT MY SCALE SAID TO ME TODAY?!!!! I AM SO HAPPY HOW YESTERDAY WENT! 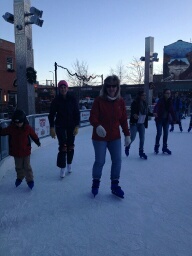 We went Ice Skating.....it was so much SCARY FUN! 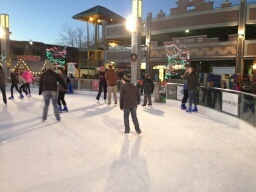 The Ice Rink is a Wooden Ice Rink, outdoors, that the City floods with water and it was overfilled.....that meant, that there is about 7' between the rink and the bench where you put your skates on of downhill bumpy ice.....downhill. (look at it in the photos below) But it was all ok....well, except that through the year they add water to "smooth" it out and they only added some water on the now Rink they had not cleaned before adding the water. Ha3 So. There were a few obstacles. BUT FUN! OH IT WAS FUN! Neither of us fell. That was the big thing. 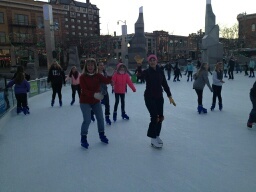 We skated for about 20 minutes or so. We just wanted to get a feel for it all again. It felt good! Really good! YES! We will be going back! After that we met friends at Cinex and Deron and I had Subway. A very very veggie filled (with meat of course) sandwich. We had Gatoraid to drink. Then we went to another friends and stayed for hours. It was realllllllly fun. We turned down the offer of food and soda. <smiles> And this morning I am so glad we did! Today, the scale was so kind! Anything A Person can do to Stay In Shape, Get In Shape, Stay Healthy, is a good thing. Playing. Having Fun Working Out, it a very good thing. Doing it with a partner or friends, makes it much more fun. And. All that laughing and talking, takes extra calories. SO THIS PAGE, SAME AS MY BICYCLE PAGE, WILL BE A BLOG. A BLOG HOPING TO ENCOURAGE OTHERS TO GET OUT AND PLAY. ENCOURAGING OTHERS TO LOOSE WEIGHT AND KEEP IT OFF THE FUN WAY! TO ENCOURAGE OTHERS TO GET HEALTHY! Actually, even though it was very cold, skating was not bad at all.....well?, let's say it was not so bad/cold that the fun was sucked out of skating. We DID have fun. 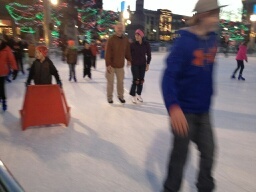 Deron and I skated after Church Dinner. It was 5 degrees! But honestly, skating, we both warmed up. 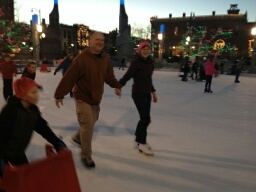 Lacing our skates on and off, with bare hands, THAT was cold. Today I found that I can still skate a circle and I can kinda still skate backwards.....both, as well as my skating in general, need (a lot of) practice. They had added another layer of water. Must have done it not long before we got there. Boy, the surface was nice, but it was, and you could hear it, cracking in some areas. 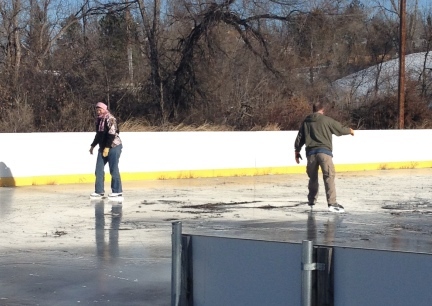 We stayed to the very outside of the rink using about 1/2 of the rink and it was fine..... but MAN! 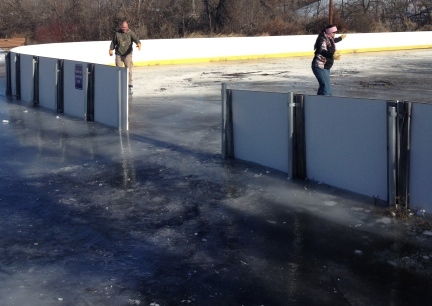 If that was frozen, we could have gotten some practice in! Deron and I skated several times early 2015....and continued skating 2015. 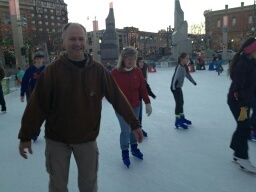 December 5, 2015 we went Ice Skating at a real Rink in Rapid City, SD....IT WAS A BLAST! We were there late afternoon til early evening. 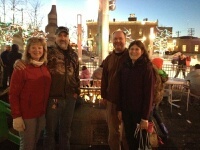 The lights and the Christmas Lights made it all like being in a WINTER WONDERLAND! Here are a few photos. 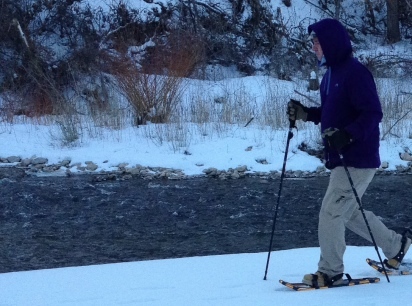 MY SNOWSHOES CAME YESTERDAY (we picked them up on our way to Rapid City, so I have not used them yet). I went to Youtube and watched the video I sent above. 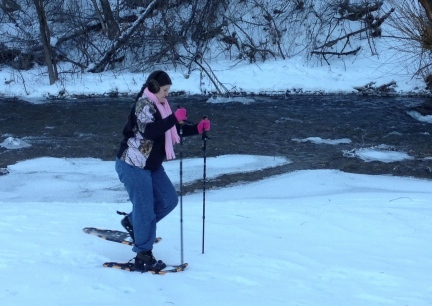 Watch it, she says, ".....it burns a ton of calories, builds endurance......." So, another fun Winter Sport to try and use to get out and still loose weight. Getting out and doing also keeps the "Winter Blues" away. 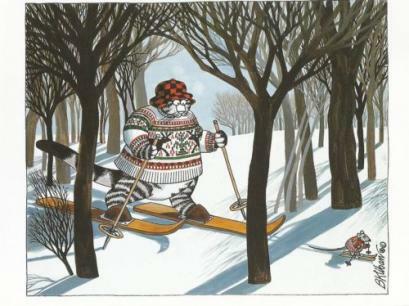 <smiles> I know if and when I get the "Winter Blues" or "Cabin Fever", I eat more.....and then...... well?, you know. 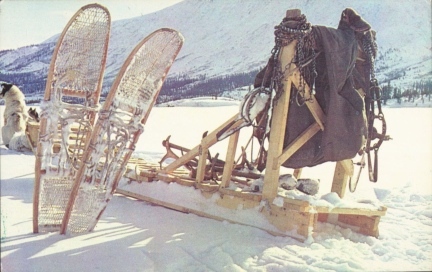 My Snowshoes are still in the box, but in a little while, they should be on my feet. I will have Deron take a photo or two. It has warmed up here, 27 degrees. MAN!, it was COLD yesterday. I don't think we got out of the single digits. I did a lot of walking in Rapid City, so I am counting THAT as my second work out for the day yesterday (first being Floor Work that I do first thing in the mornings). 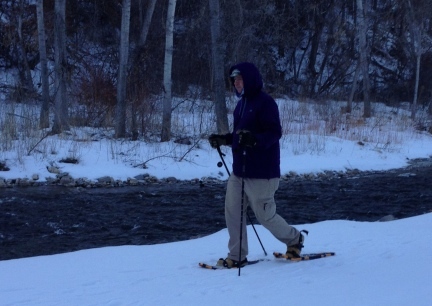 On 01-12-2015 Deron and I took a Snowshoe Hike (one at a time) around Spearfish Park down by the Fish Hatchery. It is a beautiful area and the snow there was good for this first time. 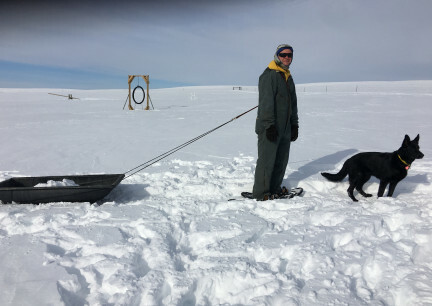 I had planned to try the Snowshoes here, but luckily, our snow is not deep enough. Suits me fine this year. Suits me fine....lots of Winter left however, so who knows how much snow we might still get here. 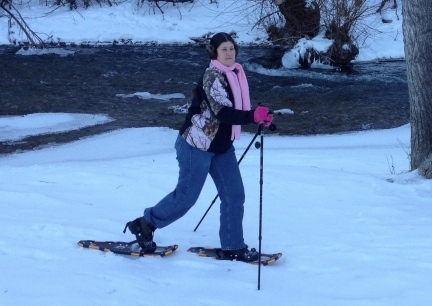 I really enjoyed Snowshoeing and am looking forward to going again. IT IS a good Winter Work Out. 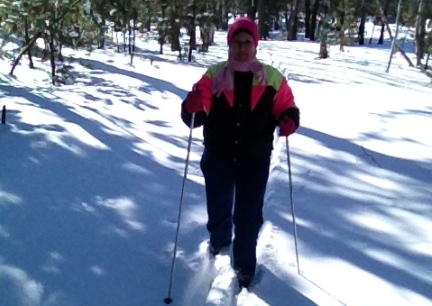 This afternoon I went Cross Country Skiing for the first time. A friend of mine, who CC Skis often, invited me to go with her and use her equipment. I am soooo glad I did! We went to Big Hill Trails, Trail Number 72, in the Black Hills National Forest and it was so beautiful and peaceful. We skied just over one hour and went about 3 miles. Yes! I did have a good time. YES! I would go again. The weather? VERY COLD! It was 15 degrees with wind. When we got back, LOTS of wind! 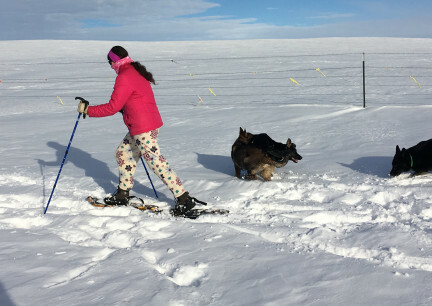 According to the books and the Internet, Snowshoeing and Cross Country Skiing are big calorie burners....and they are fun! 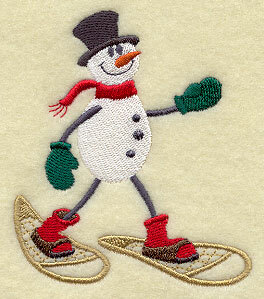 The contents of this page for Skates ~ Skis ~ Snowshoes is still, will continue to be, under construction. Please check back.